This is the 3rd in a series of Monotypes I did of a Cardinal bird sitting on a tree branch. This hand pulled print uses a ghost background from a prior printing with the bird being painted fresh onto the plate. 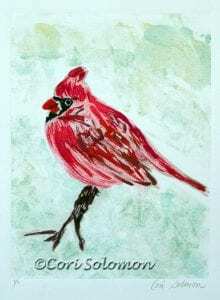 To purchase this Cardinal hand pulled print email Cori.